Celebrity fans and theatres across the Midlands have spoken of their sadness at the death of much-loved entertainer Barry Chuckle aged 73. The Wolverhampton Grand was among those to pay tribute to the comic who appeared at the theatre with brother Paul in Peter Pan three years ago. A theatre spokesman said they were ‘terribly sad’ to hear the news. The Birmingham Hippodrome, where the pair also appeared, said they were ‘devastated’, describing the slapstick star as a ‘brilliantly funny and lovely man who will be really missed’. Walsall-born Mark Rhodes and his TV presenter partner Sam Nixon, were among the first to pay tribute to one of their showbusiness heroes saying: “So sad to hear the news that Barry Chuckle has passed away. Comedian David Walliams said: “I was lucky to work with the Chuckle Brothers many times over the past 20 years. "I never got over being completely starstruck at seeing them, but always found them to be generous, kind and most of all funny. Barry and Paul recently recorded Chuckle Time for Channel 5 which manager Phil Dale had likened to the ‘wonderful days’ of filming ChuckleVision. He said yesterday: “It is with great sadness that the family announce that Barry passed away peacefully at his home surrounded by his wife Ann and all his family. 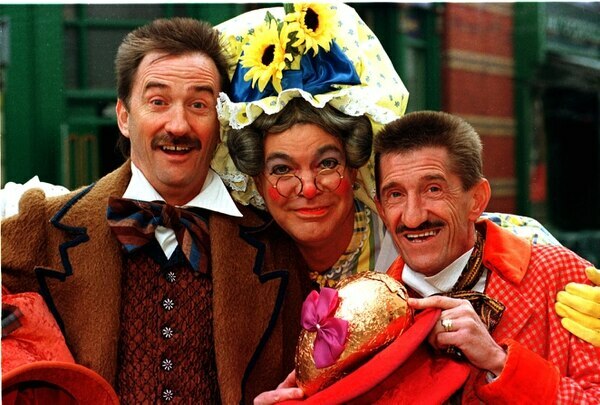 The Chuckle Brothers with Matthew Kelly starring in Mother Goose at the Birmingham Hippodrome. As well as panto appearances at the Wolverhampton theatre, the brothers also staged such children’s shows as Doctor What and the Return of the Garlicks in 2006. In 1996 they caused mayhem at RAF Cosford’s Aerospace Museum, when the brothers filmed an episode of their BBC series there. They also popped in to the Dudley Show at Himley Hall in 1998. 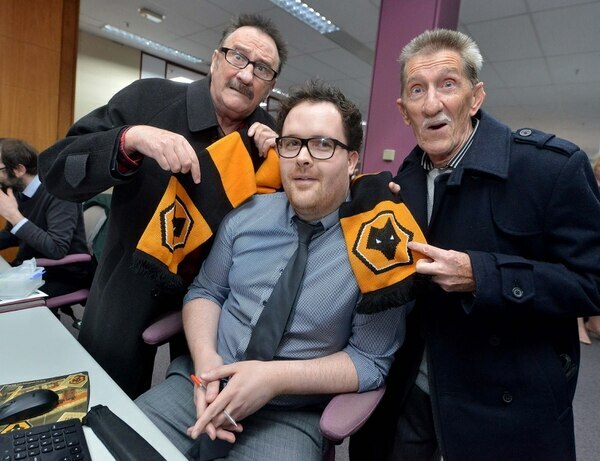 While in Peter Pan, the Chuckle Brothers visited the Express & Star to support our Christmas Toy Appeal. Deputy editor Diane Davies said: “They were very supportive and did a video appeal urging people to give toys for children in hospital and the local charities we were supporting. “And they certainly caused a stir in the office, visiting virtually every desk and posing for countless selfies. Although being Rotherham United fans they gave Wolves reporter Tim Spiers a bit of stick.